and a cute and easy flower. 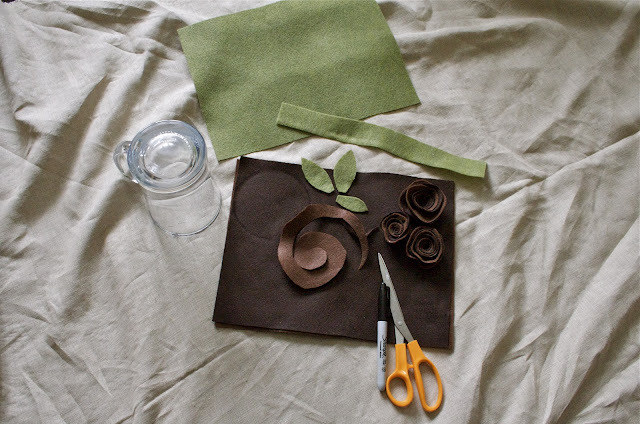 starting at the edge, cut a spiral in each circle. start wrapping, glueing as you you. darker felt after a few turns. once you are all done. attach your leaves. so that i could re-use it. but it can be reused after the package is opened! wear it in her hair. and secured it to the box with green twine. and the whole thing only took about 20 minutes to make. a rectangular strip of fabric for the bottom. and glue them to the larger circle. kinda of like pie slices. or a clock. the next at 3, the next at 6 and then 9.
the ones that were already placed. making sure not to glue down the middle. attached it to the gift box. i also covered the top of the box with felt. i like the simple look of this one as well. 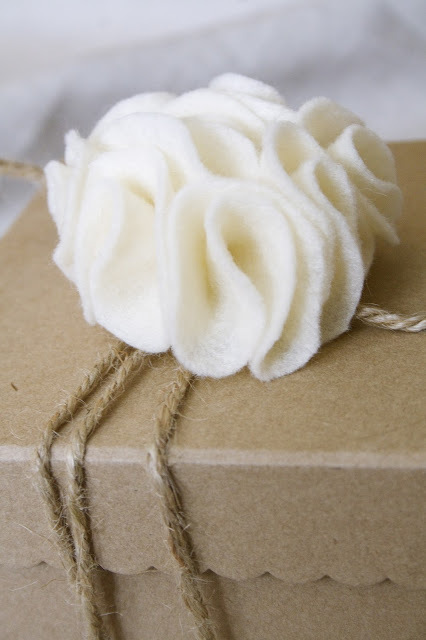 the twine and the cream felt are timeless. 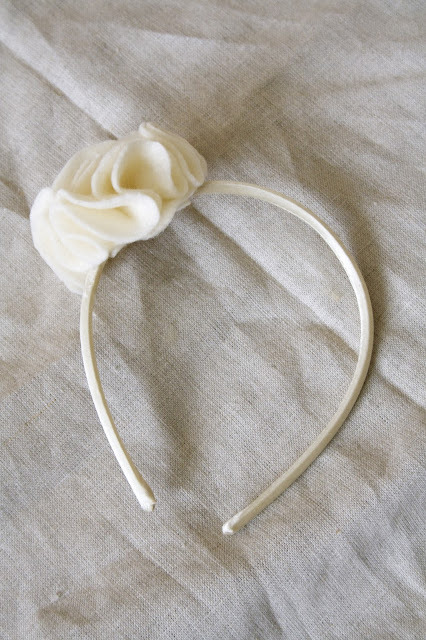 you can take off the flower and add it to a headband! I love these! So cute and functional! Thanks so much for this tutorial!! 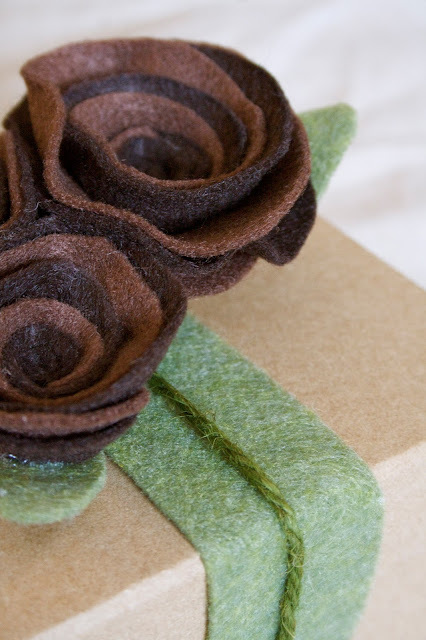 I think I'm going to try and make the roses. Thanks again. Autumn - Quit IT!! You are too darned talented!! SO adorable! 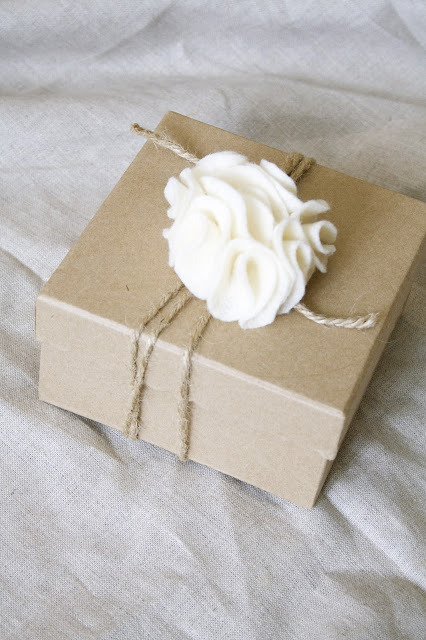 I am so stealing the natural butcher paper look with twine and creme rose for my Christmas wrapping! Thanks for sharing! Thanks so much for sharing...that was lovely!!! Lovely!! Where do you get the pretty boxes? merissa, the boxes were purchased at micheals craft store. Love this idea! I will definitely be using this as they look so elegant but are perfect for busy yet desiring-to-be-creative people like me. Have you ever tried to make these flowers with other fabrics? 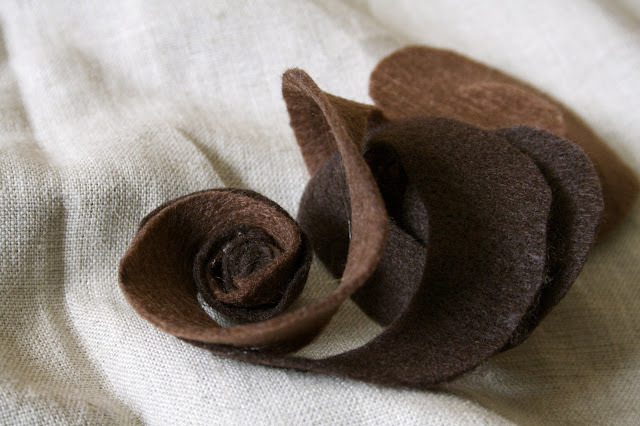 So I have officially made two of the felt flowers today! I might just fill my whole house with these, thanks for the tutorial!! 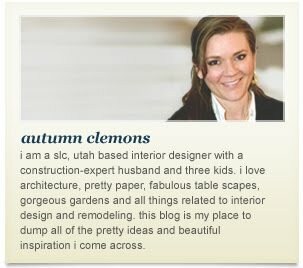 great tutorial,thanks Autumn, I am inspired to try this. just saw your link on Tatertots and Jello, very cute stuff, can't wait to check out more. You always are so clever with your wrapping! I love these! Forget the present....the wrapping is all you need! 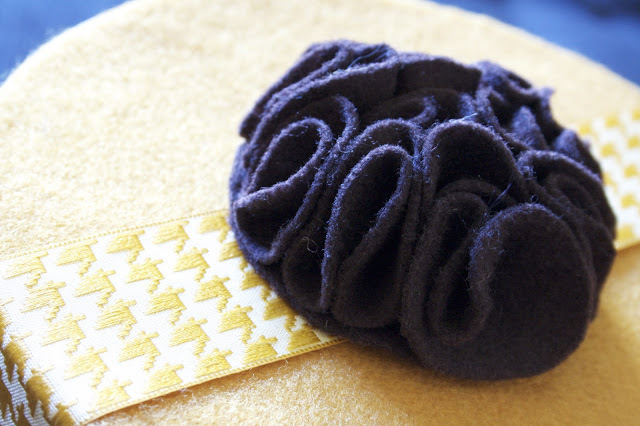 A simply gorgeous tutorial with so many options - thank you for sharing! beautiful! I'm in love with all these! I've seen flowers like these all over but your tutorial actually had me pull out some felt and try. Thank you! I love them and they are so easy to make. If I didn't run out of glue sticks I'd still be making these. Love, love, love these Autumn! 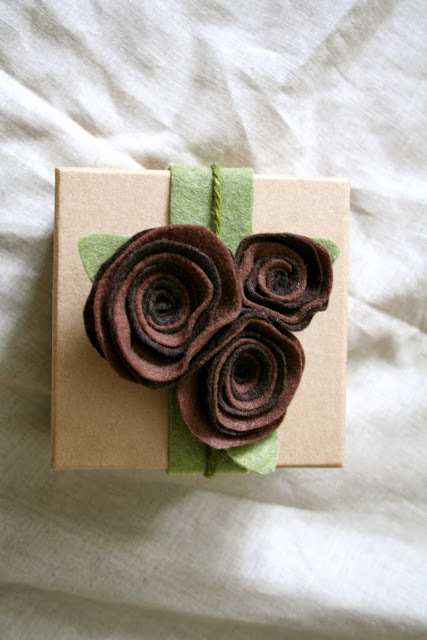 So pretty and such a great idea to make them so you can reuse them as pins, etc.. Thanks for the tutorial! 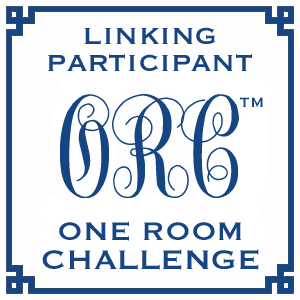 I'm going to share this link on facebook today. Oooo, lovely. I'm a sucker for pretty gifts and these are gorgeous! 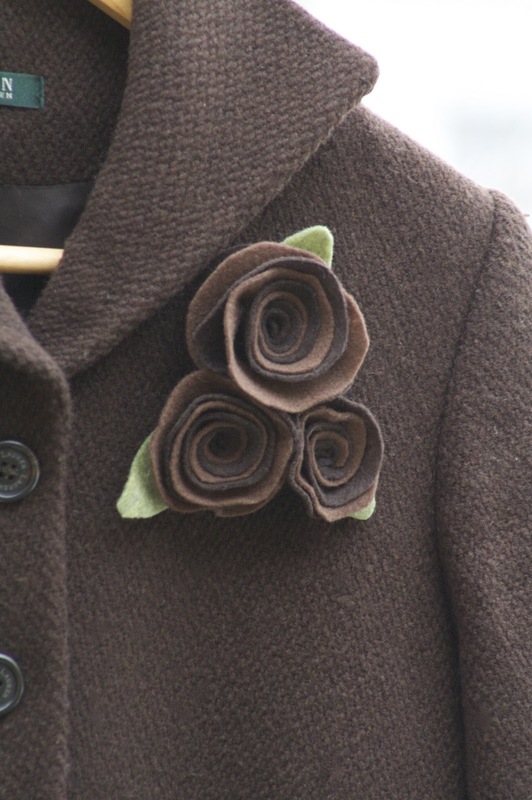 I'm so glad you made the flowers reusable- I was thinking even before I saw the picture of it on your jacket what a gorgeous brooch that first one would make (they all would, of course). They are just beautiful! 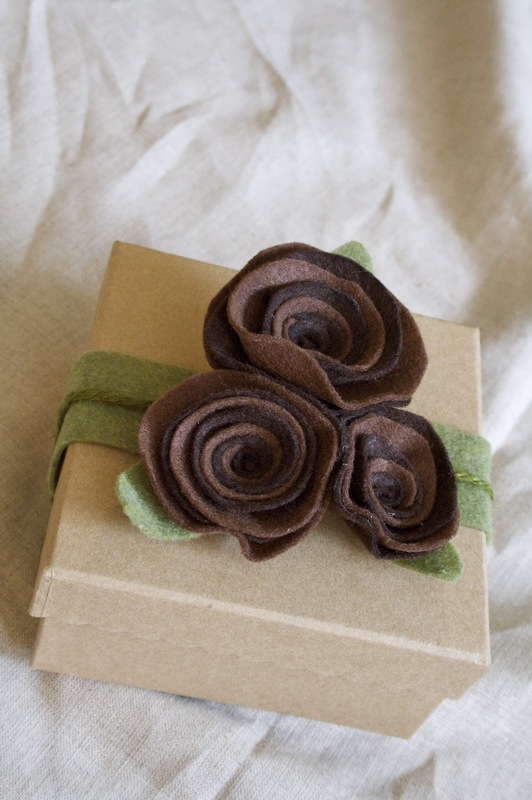 I too am using brown paper to wrap my presents so this is a really great idea to give it that little extra something! 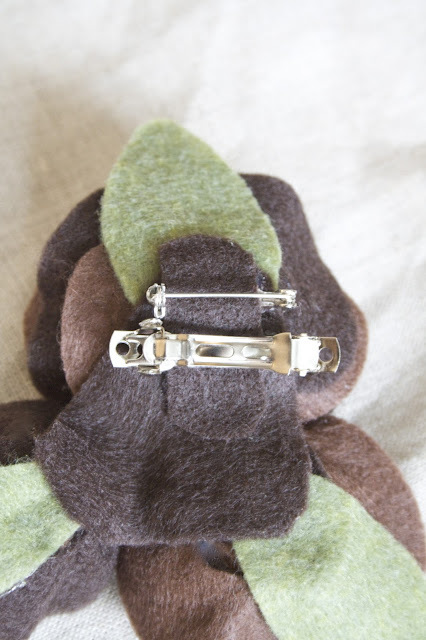 Very clever idea on how to thread the ribbon through the back too! These are so lovely. 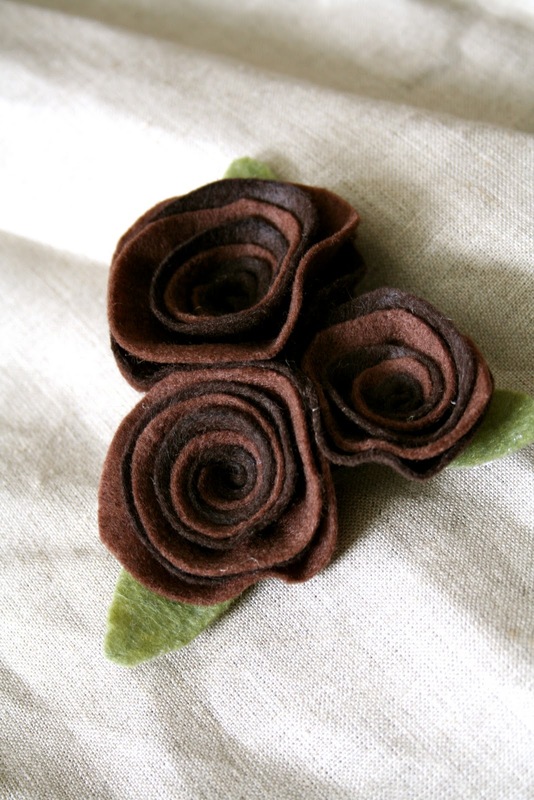 I'm making my 16 yr old niece a Bohemian bag and the felt roses will look great pinned to it. (that way she will have a pin to wear on a jacket if she wants) Thank you for sharing and bringing me some inspiration. Adorable! I needed some inspiration for some gifts - love it!! Thank you for sharing. So so beautiful!!!! thanks for linking! I'll be featuring this amazing tutorial on BCD on Dec. 21. Love it!!! Thanks for sharing, hope you are okay! Hermosas! Tambien las puedes hacer con tela de seda o cualquiera tela suave,son muy practicas,gracias por compartir,bessitos. Thank you so much for sharing! I need to do some projects as a form of therapy, rest my mind. Having something pretty to look at and create is a wonderful way to do it. I have had a rough few weeks at work while my boss is out on medical leave. I wish I could stay home tomorrow and do this all day. Thanks again! Superb. Love it. Cant wait to make it. Wow, so cute! I have been looking for ways to make the brown gift boxes I got more creative, I will definitely try this.